The triscupid valve, between the right atrium and right ventricle. The pulmonary valve between the right ventricle and pulmonary artery. 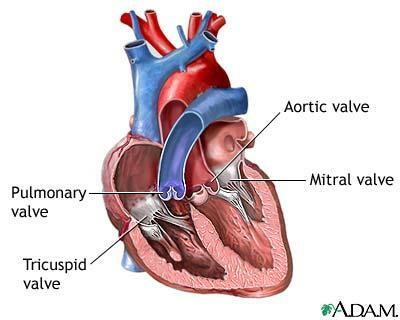 The mitral (bicuspid)valve between the left atrium and left ventricle. The aortic valve between the left ventricle and the aorta. Fig. 1 The location of the four valves in the heart. Each valve has a set of leaflets (the mitral valve has two, the others have three) which open and close with the flow of blood. The leaflets themselves are passive, relying only on the flow to open and close them. Each valve is attached at the base of the leaflets to a papillary muscle, which provides support and limits movement of the valve. These valves work continuously through one’s lifetime. Given the load and environment, it is not inconceivable that these valves can malfunction or fail. Here, we will discuss heart valve replacement designs and their advantages and disadvantages, as well as potential future improvements.